FAQs & Additional Program Information - Coaching and Leadership International Inc. This page updated March 25, 2019. How is obtaining a coach certification beneficial? What are the top 3 to 5 criteria a coach should consider when selecting a coach certification program and why? There are a lot of coach certification programs�how are our training programs different? What is the title of CLI's Coach Training and Certification Program? What is the Philosophy of CLI's School for Power Coaching with Mind-Kinetics? What are the Vision and Goals of CLI�s Coach Training and Certification Program? What are some of the Coach Training goals that I might achieve when I study CLI's PCMK� Coach Training Program? Who can apply to learn Power Coaching� with Mind-Kinetics� and who are the intended participants? What are CLI's prerequisites and registration requirements? How is the CLI PCMK� Power Coach Training Program delivered? What are CLI's policies on withdrawals and refunds? What are CLI's policies on the payment of tuition and fees? What are the CLI Discipline and Dispute Resolution Policies? A coach certification from a coach training company is vital because it will prove to the world that you are coaching according to the ethics and core competencies of this industry. For example, coaching is about helping people go inside to find their own answers while consulting is about analysis and possible solutions. Mentoring is about giving advice. Counselors are more like archaeologists � they help you �dig� into the past and usually spend quite a bit of time in the past to repair your life. People need to be clear on what service you are offering them. A coach certification from a coach training company is vital because they will give you a certificate that says you have met the standards of the industry. A coach certification from a governing body may be important to you if you wish to conduct Executive coaching work in corporate and government. In Requests for Proposal, corporate and government officials will often ask for a credential/accreditation from a governing body. For life coaching, as long as you have your certificate from a reputable coach training company, clients are usually not so concerned about a certificate from a governing body. Select a program that can prove a high return on investment from their coaching methodologies because the industry is turning out some Coaches who have difficulty providing the client with top rated results. As the Coach you must be able to coach the client using life-changing coaching methodologies and tools and then help them measure their results at the end. This will more than guarantee you a business in coaching because clients like doing business with successful people. If you wish to be an Executive Coach, select a program that will train you to be both an Executive and Life Coach. Once an Executive develops trust with you, chances are they may need you to help them with their personal goals such as health, their relationship with their spouse/children and their spiritual life. Vitally important is for a program to show you how to coach at the subconscious level. 95-99% of our behaviours are operated by our subconscious mind. Our subcon is 1 million times more powerful than our conscious mind. Our limiting beliefs are located in our subconscious mind; therefore, a coach needs to know how to help a client find those limiting beliefs and then switch them to positive beliefs for permanent positive change. Clients want to maximize the value they receive from a Coach. Therefore, they want to experience that they have permanently shifted their beliefs, actions and patterns. The results are remarkable! With CLI�s powerful, award-winning set of methodologies at your command, you, your organization and clients will prosper as you, now, address every challenge and goal at an entirely new level of thinking, that sparks innovation, insightful solutions, and clear action steps forward � sparking profound positive change. Learn how to Build a Booming Business! As described throughout this web site CLI's Coach Training and Certification Program is referred to as Power Coaching� with Mind-Kinetics�. The CPC, Certified Power Coach� Program (Level 1 + Level 2) is accredited by ICF. The full Professional Certified Power Coach� Program, (4 Levels), also includes the ICF accredited supervised training hours common to the Certified Power Coach� Program. What is the Philosophy of CLI's School for Power Coaching� with Mind-Kinetics�? 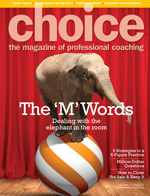 CLI believes that coaching is "all about the Client". It is the Client who chooses their issues and goals, the speed at which they wish to progress and the solutions they wish to act upon and when. Science has proven that habits and behaviours will only change if there is a physiological shift in the brain body. Therefore, built into every Power Coaching� tool is CLI's science of Mind-Kinetics� which literally "opens our minds" to tap into our own genius. A system which recognizes that every Client is already perfect and whole with the answers inside of them, encourages the Client to self coach daily which catapults their success. CLI believes it is critical to keep the spirit of a Client intact in order to create a safe environment where the Client can truly learn how to better love themselves and use that self-love to overcome all fears for optimal success. At CLI we coach the whole person. For example, an Executive may need coaching on two entirely different issues: strategic planning and how to better communicate with his wife. CLI's Power Coaching� tools are universal, used in all areas of life for all issues and goals. PCMK� also works on all four levels: emotional, spiritual, physical and intellectual. The tools are universal. The Vision of the PMCK� Coach Training Program is to inform the public at large about the power of thought. �What we think we become� is a Universal Law. This means that whatever fears or negative thoughts we have about ourselves and others, we will manifest. Therefore, it makes perfect sense for all ages to learn PCMK coaching and self-coaching methodologies to permanently turn their negative thoughts into positive ones. To support you in the growth of your business as an entrepreneurial coach or, if you are an internal coach, to help you inspire all of your managers to have a 1-on-1 Coach and also learn coaching as an important leadership skillset. stick with the training � go all the way to the top and become a Professional Certified Power Coach� - you will have learned 80+ full session coaching methodologies for coaching mind, body and spirit. Over the years, CLI has witnessed that busy Executives cannot compartmentalize their lives! They may have life partners and children and work in the community. PCMK� meets their needs as well as the needs of their partners and children because it is a world-class professional AND personal development program. PCMK� revitalizes the lives of anyone who studies it. Power Coaching� with Mind-Kinetics� attracts a wide range of participants in both the private and public sectors. Here are just a few of the types of individuals and groups who study PCMK: CXO�s, Senior and Middle Managers, Business and Thought Leaders, HR/OD Managers, Trainers and Sports Coaches, Moms and Dads (who wish to learn how to self-coach and coach their family members), Helping Professionals such as Teachers, Counselors, Nurses, Doctors, Naturopaths and Lawyers. Leadership Development � CEOs, Executives and Managers at all levels of an organization, expand skills and competencies, engage, inspire, and lead teams and organizations to greatness. Be a Leader that creates other Leaders with Logic & Heart. Executive & Business Coaching � Become a highly sought after Executive and Business Coach, with high-level skills, tools and confidence to inspire transformational leadership. Your clients will step into their highest power with true strength and integrity. Whole Life Coaching � Step into your purposeful path of Service with everything you need, in hand and heart, to support positive change for yourself and your clients to thrive. Stand out in the field with the skills, tools and wisdom to make a profound difference. The main requirement is your commitment to work diligently, learn the Mind-Kinetics skillset and guide yourself and your clients to create permanent positive change in all desired areas of life. In addition we ask that you set up an interview with one of our senior instructors to make sue that you have a clear understanding of our program. Once registered we also ask that you watch 2 recorded introductory webinars, complete several supplied assessments and create your personal Learning and Development Plan. Associate Power Coach� Level students begin their journey with two introductory webinars � 2 hours each. Level 4: PCPC - Professional Certified Power Coach� = 4 days of face-to-face training. Following classroom training, On-site students of all levels attend multiple Telementoring classes to hone their coaching skills further with a CLI Instructor listening and giving feedback. All of the levels mentioned above are also taught via distance learning. Students who prefer to study via distance learning attend two classes per week with each class being two hours in length. Most classes are conducted over the web or phone; however, beginners of the APC program attend 13 webinars to more effectively cover the definition of coaching, philosophy of coaching, core competences as well as models and theory. You may choose to combine how youo learn. For example, you can learn the APC level via Distance Learning and then switch to Face-to-Face training for your next levels. Refunds: CLI class sizes are kept small to promote better learning therefore your commitment is paramount and refunds are not available following registration payment. When unforeseen situations arise CLI will work with you to reschedule your training to complete your course at the next offering of the same course within 12 months of the original course start date (also presented for approval during the registration process). 'Pause' Your Training: In the case of special family or medical emergencies and upon the presentation of a Doctor's certificate CLI will allow you to pause your training and complete your course within 12 months of your 'Pause' starting date (also presented for approval during the registration process). Withdrawals: Students may withdraw at anytime however funds are committed and non-refundable once received by CLI. What are CLI's policies on the payment of tuition and fees. Payment is due at the time of registration and we also offer deferred payment plans as described on this linked web page: Payment Plans - Monthly Payments. Coaching and Leadership International Inc. is committed to providing maximum benefit and fairness to all students who register for the Mind-Kinetics� & Power Coach� training and certification programs. A student or graduate, (the person), may be disciplined, put on probation or dismissed from a Coaching and Leadership International Inc., (CLI), course of study or CLI Membership for any, all or a combination of the reasons listed in The CLI Discipline and Dispute Resolution Policy. (pdf). It is always the responsibility of the individuals involved to try and resolve issues informally and peacefully. If a more formal approach becomes necessary CLI provides a fair and reasonable mechanism for resolution.